A new study reveals a surprising benefit of getting laser eye surgery rather than wearing contact lenses. Researchers found that people who underwent LASIK refractive correction surgery had a lower risk for contracting microbial keratitis than contact lens wearers. Scientists involved in this study compared data from the health records of patients who underwent LASIK eye surgery and those who wore contacts over a period of five years. Both people wearing daily disposable lenses and extended-wear lenses were observed in this study. The results from this long-term meta-analysis clearly showed that microbial keratitis was more common in people who wore extended-wear contacts than any other group. Over time, the LASIK patients had the lowest risk for developing the infection. For those who didn't know, microbial keratitis is a bacterial infection that affects a patient's cornea. While this bacterium can infect anyone, it most often occurs in contact lens wearers. A few symptoms of microbial keratitis include eye discomfort, increased tear production, eye sensitivity, and eye discharge. This infection could lead to blindness without proper medical care. Researchers noted that people who used extended-wear contacts had a 20 percent higher risk of developing microbial keratitis than people who used daily disposable lenses. People who wore extended-wear lenses overnight had the absolute greatest risk for contracting the infection. This study is obviously a positive for people who advocate LASIK surgery, but that doesn't mean contact lenses are all bad. Dr. Aaron Waite, an ophthalmologist at the Hamilton Eye Institute, told reporters that the incidence of the microbial keratitis is still relatively small. As long as people take good care of their contacts, catching microbial keratitis shouldn't really be an issue. In the future, researchers involved on this study want to look at other differences between contact wearers and LASIK surgery patients. For example, scientists want to compare vision quality, glare, and dry eye symptoms between the two groups over an extended period of time. 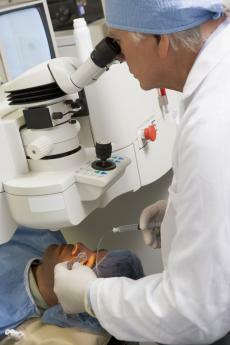 As of today, around 100,000 people in the U.K. decide to undergo LASIK surgery every year. Although these laser surgeries have come a long way in recent years, they are not without potential side effects. Some people experience dry eyes, double vision, and astigmatism after having LASIK surgery. It's important to have a long conversation with your eye doctor on whether or not LASIK is a good idea for you. Contact lens wearers must practice good hygiene to prevent contracting infections like microbial keratitis. Some of the main habits all contact wearers should make a part of their daily routine include washing their hands before taking out or putting in their lenses, taking lenses out before bedtime, and never exposing contacts to water. Anyone interested in reading this study can check out the full article in the Journal of Cataract & Refractive Surgery. This particular study was entitled "Risk for microbial keratitis: Comparative metaanalysis of contact lens wearers and post-laser in situ keratomileusis patients."